Lose the Back Pain: 3 Back Surgeries, Chiropractors & Drugs FAILED to Help His Herniated Discs. 3 Back Surgeries, Chiropractors & Drugs FAILED to Help His Herniated Discs. He’s Running Marathons Now! “In July of 2006 I hobbled down Mt. Rainer in Seattle, Washington. I told everyone it would be my last climb. I just didn’t think my 55year old back could take it anymore. You see, I was born with an extra bone connecting my left hip to my spine. That caused some pain from the get go. But what really did me in was a 6 foot fall off a scaffold while working construction. That herniated 3 discs (after already having had two previous back surgeries for herniated discs). I tried a chiropractor but that really didn’t help. Three separate back surgeries didn’t fix the problem. Neither did the muscle relaxers, pain pills, and 800mg of ibuprofen I took every 8 hours (which, I’m now finding out destroyed my stomach lining leaving me wracked with gut pain, but that’s a different story). Doctors said my last option was a “spinal fusion” surgery from my tail bone to my mid back. Knowing 2 people who already had that surgery and are now legal drug addicts I was desperate for a better answer. The Mt. Rainer climb was to be my “last hurrah”. Well, I came across your Lose the Back Pain® System while trying to find a less barbaric option than surgery and decided it wouldn’t hurt to give it a shot (plus, it is less expensive than a week’s worth of chiropractic appointments). I bought it and a week later I didn’t need the muscle relaxers, and 2 later weeks I did not need pain pills anymore. Three weeks into it I quit taking the ibuprofen too. 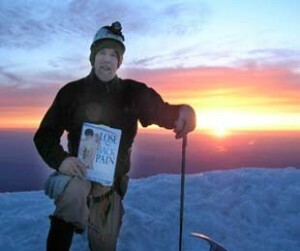 I continued to follow your program and May 25, 2007 – 10 months after thinking I’d never be able to climb again – I carried an 85 lb pack over a mile in the snow and over 1000 ft of elevation up Oregon’s tallest mountain, Mt. Hood and set up a base camp. 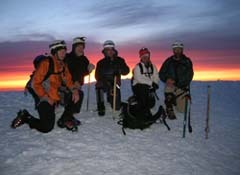 That morning, I and my companions were the first people in Oregon to see the sunrise from on top of Mt. Hood. That was 9 years ago and – at 65 years old now – I’m still climbing, back packing, taking down trees for firewood, and running 4 half marathons every October as a Fund raiser for “Send Hope”. And it’s all thanks to the Lose the Back Pain® System. My entire life I was trapped by the idea my pain was caused by the extra bone pushing on my nerves. And then later that the three ruptured discs from the construction accidents caused my pain. But that was never the case. It was because of muscle imbalances that your program fixed in a matter of weeks. It WILL Change Everything for You, Too. Click to See Why We GUARANTEE It! If I would have learned about this sooner, it would have saved me decades of pain and frustration. But I consider myself lucky. Because if I didn’t come across your website I’d probably be stuck in a wheelchair right now with a fused spine. Today, I’ll show YOU how to ditch your pain pills, avoid the surgeries and get back to doing what you really LOVE. Click here and I’ll show you EXACTLY how YOU can use our Lose the Back Pain® System to reverse decades of pain, tightness and restriction. Pretty soon, you’ll be sending me a letter just like Rich’s above, telling me how you healed your old injuries, eliminated the pain, and proved everyone else WRONG! I see probable relief from a lot of years of limited walking and standing and lifting I will buy it as soon as I can afford to, a top priority, right after God. Since you consider yourself one of God’s children, I’m sure God would want you to take good care of yourself by addressing your pain in a healthy manner so that you can continue to serve Him without being in pain! what is decompressive laminectomy? I have spinal stenosis. I am 81 yrs. Decompressive, for the purpose of taking the pressure off the nerve. Laminectomy, Means to cut away of the Lamina to make room for the nerve. In most cases it is done in the Lumbar region of the spine.